This is the third of a four-part series documenting the life of poker superstar Daniel Negreanu. Before you read Part 3 it's recommended to read Part 1 and Part 2 to get the complete picture of Negreanu's life. In many ways Daniel Negreanu is the face of the game of poker. He’s well spoken, takes time for his fans and above all else he still performs at an elite level after over 20 years in the game. Negreanu wasn’t always a professional, star and celebrity in the game, but over time things changed. The Canadian poker player was ahead of the curve and always thought poker would be a bigger deal than it was when he started. Long before big sponsorship opportunities surfaced, Negreanu was just another poker player looking for his big break. “Back in 1998, after I had won my bracelet, I remember Huck Seed and Howard Lederer doing their pool for the Main Event. Huck said, ‘How about that guy?’ when he pointed to me, and Howard had no idea who I was. In my mind I knew I could crush him already, but of course I didn’t say anything,” Negreanu said, as after winning a bracelet in 1998 he slowly but surely became a well-known player among his peers, and just three summers later he had a chance to reach a much bigger audience in the Main Event. Nowadays making the final table of the WSOP Main Event is a lot tougher than when Negreanu first played in 1998. That year 350 players entered and Scott Nguyen managed to take the event down. To date Negreanu has cashed four times in the Main Event, his best result dating back to 2001. In that event he was chip leader with 13 players remaining but one big hand turned things around. “The hand I played in the 2001 Main Event that resulted in my elimination was a very big lesson, especially now I know that there’s no reason to do anything stupid in the situation I was in. One crucial hand basically ruined my chances, and it was Carlos [Mortenson, the eventual winner] who raised under the gun to 32,000 at 5,000/10,000. Bet sizing was very different back then and that was a standard raise. This other guy, Henry Nowakowski, made it 150,000 and I’m not even joking about those bet sizes,” Negreanu laughed, as he realized how much it has changed over the years. “I was still in the tournament but short after having given up all my power in this coinflip situation. Give me that same scenario now and I would’ve just folded my hand preflop. I was young, just 25 years old at the time, and I didn’t realize there was no need to gamble at that point. I was so much better than the other players with my small ball approach, which was way ahead of its time. I could’ve just nickel and dimed, played lots of small pots, and made the final table almost for certain,” Negreanu said, as he was ultimately eliminated in 11th place. One player who never shied away from making big aggressive moves was Stu Ungar. The phenomenal player missed out on the poker boom as he passed away on November 2nd 1998, just months after Negreanu won his first bracelet. In retrospect Ungar could’ve had a long lasting rivalry with Negreanu had he been alive to play during the glory days of the game. Both players played a creative and aggressive style and Negreanu was particularly successful with his small ball style. This however never happened, but Negreanu did feel an eerie connection to one of the best players that ever played the game. “I wouldn’t say Stu Ungar was a role model of mine, but I got a chance to play with him about a week before he died. In the Bellagio top section he started a No Limit Hold’em game, something I rarely played, and I thought ‘I might never get a chance to play with him’ so I sat down. I remember him playing a super aggressive style and he went off for five or six buy ins. I still clearly remember that every single hand went through him, every hand you had to beat him in some way, he played a lot of pots and his style helped me develop a new gear in my own game,” Negreanu said. “During that sessions I vividly remember a priest walking up to Stu and the two talking about their meetings on Wednesday and Thursday. It was clear to me that Stu was trying to clean his life up. Reports show that he died in a hotel room alone. It was because he was so frail and skinny that he died from trying to get off heroine. What killed him was trying to get clean; his body just couldn’t handle that enormous shock, ironically,” Negreanu said. “Most people will think I’m crazy, but let me tell you a weird story about a dream I had the night he died,” Negreanu said, as he slowed down from his usual fast chatter and switched to a more serious tone. “He [Stu Ungar] was in my basement. I went down there. It was cold and scary looking. He looked at me and said, ‘Don’t do what I did kid. You gotta fly straight’. He was basically warning me about the dangers, and when I woke up I found out he died that night, which seriously creeped me out. I’m not sure how much of all this I can believe, but it happened. Him passing was very surreal to me because of that,” Negreanu added in a very serious manner. This doesn’t take away from the fact that Ungar was truly special; he was known to learn a new game and figure out how to beat everyone within days. A ESPN documentary about Stu Ungar, shot in the early 2000s. Ungar’s career ended in tragic fashion, but the journey had just begun for Negreanu. Being invited to the UK’s Late Night Poker was the first step to fame, but the experience at that tournament was somewhat peculiar. “After getting invited to Late Night Poker I felt like I had arrived, as I’d been around for a few years at that point. There’s a crazy story about my travel out there, which is more interesting than the actual tournament. It took me something like 36 hours to get there, to Cardiff, and when I got there I ran into Padraig Parkinson and some other European players. They were drinking some dark beers and I had a few of those, perhaps a few too many, and this is very embarrassing but I’m going to tell it anyway,” Negreanu laughed, “I’d never peed in my bed even as a kid, but after traveling for 36 hours and drinking these dark beers I woke up in the morning after a dream that I was peeing. I woke up and it was wet everywhere. I was so embarrassed because they invited me to this swanky hotel and I pissed the sheets. I had the sheets hanging out of the window and I never let me maids come in because I was just too embarrassed,” Negreanu burst out in laughter. “About the tournament itself; I was pretty quiet during the taping. I was playing with some European players that I didn’t really know, so I didn’t have a connection with them yet. It was also one of my first times in Europe so I didn’t want to come off like some loud pompous jerk,” Negreanu said. In 2002, during the $5,000 Omaha hi/lo tournament at the WSOP there was no need for loud pompous behavior, as the three-handed match between Mike Matusow, Marcel Luske and Negreanu turned into a show anyhow. The three stars of the game battled it out for a bracelet and the former managed to take it down. We wondered if this might’ve been the best tournament for TV that was never televised. “That event sure would’ve made for some great television. First of all, Marcel was playing most of his hands in the dark with his sunglasses upside down. Once we busted him we started having some beers, my mother was on the rail, Mike’s mother was on the rail, we were needling the crap out of each other and I got a big chip lead. All of a sudden Mike goes on the massive tear and ends up beating me, but it was all fun loving. We were friends at the time and we still are and while there were no cameras on that event, I’m sure that would’ve made for some great television,” Negreanu said enthusiastically. The year in which Chris Moneymaker put poker on the map for good was also huge for Negreanu, who won his second bracelet and just missed out on his third. Negreanu however did not make a deep run in the Main Event, and his actual memory of the event was much different, up until ESPN aired the eventual show they made out of it. “After Phil Ivey finished in 10th place, I didn’t really have any reason to follow the tournament anymore. I was really rooting for him and hoping he would do well, so after he was knocked out, I had no idea what it could mean for the game of poker. At the moment, when he won, I don’t think anyone had any idea of what the potential of this victory was. ‘The Moneymaker effect’ was something that nobody could’ve ever seen coming until it was broadcasted on ESPN,” Negreanu said. “441 Productions filmed the entire Main Event and put the back stories together so the actual broadcast didn’t air until the fall. I remember CNN reporting that a guy named Moneymaker won the WSOP Main Event, but besides that nothing really happened until that famous broadcast. The incredible team of 441 did such an amazing job of selling the Cinderella story about this guy who came out of nowhere, some accountant, playing his first ever live tournament. He qualified for $40 and all of a sudden, he won $2,000,000. When it finally happened on TV, and the way they portrayed it, it got a ton of people at home watching, thinking to themselves, ‘I can be that guy’ and they genuinely believed that. We don’t have that anymore in 2014, it’s not a storyline that works anymore, but at the time it was the perfect storm,” Negreanu said reflecting on the magnitude of that event. The games Negreanu played in, mostly mixed games, didn’t change all that much but the World Poker Tour exploded. The first ever WPT event was hosted in May of 2002 and drew a crowd of 146 player. A year later the Ultimate Poker Classic, a WPT event on Aruba, drew a crowd of 436 players a month after the Moneymaker victory aired. Negreanu couldn’t have picked a better year to excel in, as 2004 became his most successful year ever. Fresh off the Moneymaker boom tournaments were bigger than ever and the Canadian pro became one of the most famous players in the world. Negreanu however doesn’t think that his success in 2004 made a big contribution to the game. “I also remember being slightly disappointed in 2003 when they interviewed Jennifer Harman, Annie Duke and Howard Lederer. They weren’t interested in my story while I was good friends, and still am, with Jennifer. In 2004 I put together a really good series and that’s when they noticed me. In the side interviews, the questions that they asked were all a part of finding out the beginning, middle and ending of the story. When they shot these one-hour episodes they were making documentary-like stories. The way they shoot poker nowadays is nowhere near as good as that. The main reason is that they were looking to tell a story back then while now it’s all focused on the poker,” Negreanu said as he opened up an entirely different discussion. Negreanu took the floor and strongly advocated returning to the old format, in which the focus was put on the people, not the poker. During the years 441 Productions produced the poker shows many players were ‘discovered’ and the famous pros we know up until this day, all came from that era. “We absolutely need to go back to what it used to be like. To think that back then there were people like Allen Cunningham, Chris Ferguson and Howard Lederer, who didn’t say a word at the table. There are so many players right now that are equally, if not more, interesting than these guys, but the problem is that these stories haven’t been told yet,” Negrenau said referencing to the discussion that flared up during the Aussie Millions about new champions and pro players not being entertaining enough for amateurs at their table. “It’s very hard, or even almost impossible, for young guys to break into the realm of ‘famous poker player’ right now. Poker hasn’t been at its peak in the United States for quite some time and that’s a big reason for it. The game has been growing everywhere else and tons of people watch the EPT broadcast, but in terms of the US, which leads the way in many ways, people just remember the old names and they don’t really know who Andrew Lichtenberger is,” Negreanu said. As a suggestion we brought up the fact that the German pros could perhaps be the new wave of famous poker celebrities if they were marketed the right way. The big problem with reverting back to the way it was, and once again market certain new faces, is that poker in the United States was just brought back to life after Black Friday. Because of this, it’s unlikely many changes will be made, but it’s good to look ahead. 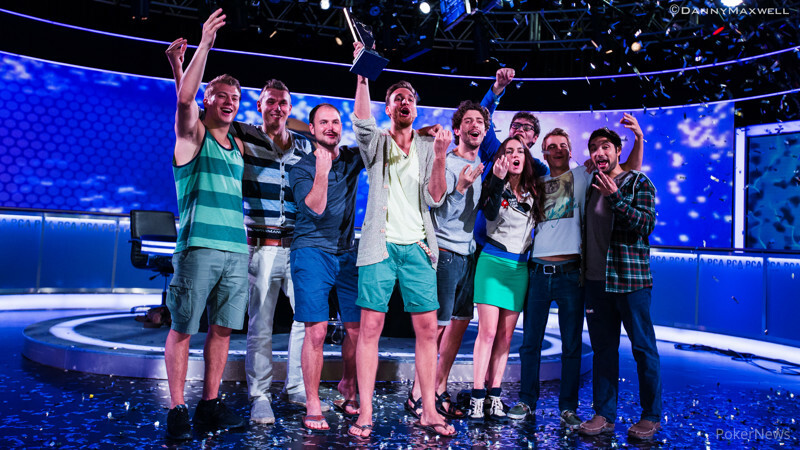 Fabian Quoss' winner photo after the 2014 $100,000 PCA Super High Roller with Max Altergott, Marko Neumann, Tobias Reinkemeier, Igor Kurganov, Liv Boeree, Mustapha Kanit, Philipp Gruissem and Timothy Adams, the new generation of poker super stars. The World Series of Poker has continuously expanded their Main Event coverage with the introduction of the live final table on ESPN in November of 2012. Personalities are created in the months leading up to the live broadcast, but it’s not like it used to be as Negreanu continues. “I think we have to go back to what it used to be like. It’s a huge mistake to sell poker based on the merits of the game and as a sport. That’s one of the mistakes the World Poker Tour made, waiting too long with promoting the personalities. It was all about the people for ESPN and that’s why they became so much more popular when it comes to viewers and ratings. The WPT depended on the game being exciting enough, and it’s not!” Negreanu yelled to emphasize his point of view. “I think today it would be great if we went back to the black backdrop during play. This way the faces stand out more and it would be more about the players than about the game. The problem today, with it being just about the game, is that only people who really love the game are going to watch it. You’ll be bored out of your mind nowadays if you watch the WSOP. In the old days there were key highlight hands, it was exciting, there was some poker but it was minimal compared to what you’ll see right now. “I think that this experiment of the producers is failing. I know that they are listening to certain test groups, but they are just not hitting the market the way they should. Poker is a niche game, or sport, already and when you alienate people even further by making it more complicated than it needs to be, it makes our viewership smaller and that’s bad for everybody,” Negreanu strongly stated. In the final part Negreanu talks in-depth about his amazing 2004, playing in the big game at the Bellagio, his website FullContactPoker and how he saw a multimillion dollar deal evaporate because of the passing of the UIGEA. On top of this, Negreanu talks about playing with the late Chip Reese and his experiences on the High Stakes Poker set.